He has blue black hair,that's spiky in the back. He wears the Akatsuki cloak,but removes it from the top half of his body in battle. 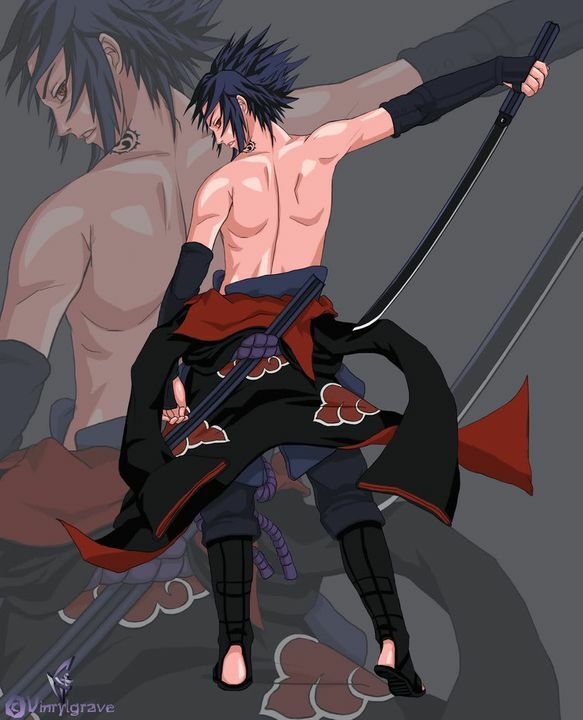 Underneath he wears kimono like clothing,with the Uchiha crest on the back. When he activates his mangekyou shraingan it looks like this. He has the curse mark on his left shoulder,it looks like three dots with a seal around them. He has a lightly muscular build,and dark eyes. Personality: During Part I, Sasuke was considered the best Genin of the Rookie Nine and could have been the strongest. To this end, Sasuke's only desire as a shinobi was to get stronger, and he saw everything from his teammates, to the other villagers as simply being in the way. In fact, during their bell test with Kakashi, Sasuke's reason for not working with Naruto and Sakura was because he thought they were respectively weak and annoying, and they would get in his way. However when he was proven wrong by Sakura's knowledge, and Naruto's desire to also become stronger he began to value his teammates and even began to risk his life to save them if he needed to, valuing their lives more than his desire to kill Itachi. During the Chunin Exams, Orochimaru noticed how Sasuke's desire for revenge seemed to have lessened, and branded him with the Cursed Seal of Heaven to give him a taste of the power he could have if he keeps to his previous path of vengeance. Even when Kakashi sealed the Cursed Seal, Sasuke began to draw more and more power from it in hope to get stronger. However even with the Cursed Seal, Sasuke began to envy Naruto, whom he saw as being much weaker than himself, because in their brief encounter, Itachi says that Naruto has a "special power" and that he came back to Konoha to find him, not Sasuke. Slowly Sasuke saw Naruto surpass him, and in the end, Sasuke decides to leave Konoha to join Orochimaru to make himself stronger. Sasuke remembers that Itachi told him that in order to be as strong as him, Sasuke had to gain the Mangekyo Sharingan and to do that, he had to kill his best friend. When given the chance to kill Naruto and get the Mangekyo Sharingan, Sasuke simply punched him in the chest, sparing him as to not give Itachi the satisfaction of seeing him follow his path. In Part II, Sasuke showed he had stayed true to his original personality. When first meeting Sai, he did not care the slightest and was interested more in Orochimaru's training him. When Sai states that he might be able to get along better with Sasuke than he did with Naruto, Sasuke freezes him with a stare, catching Sai in a genjutsu which involves a large amount of killing intent. Sai is amazed that even an emotionless person such as himself was affected by Sasuke's gaze, showing the power of his Sharingan. When Sai comments on how Naruto and Sakura have been searching for him, Sasuke once again shows his uncaring nature. It would appear that during his time with Orochimaru, he has come to the conclusion that if he ever wishes to stand a chance against Itachi, he needs to push away all of his past bonds with his friends and make revenge a priority, above even his own life. Because of this, he shows that he no longer cares about Konoha or anyone from his former village. In spite of this, he scolds Naruto about risking the lives of an entire squad to save one man, and comments that it could damage his chances of becoming Hokage. He also states that, unlike their last encounter at the waterfall, he has no more reservations about killing Naruto, and attempts to do so. He's also aware of the fact he is intended to be the container for Orochimaru's soul, showing that he doesn't care what happens to himself as long as it results in Itachi's death. This attitude seems to have changed, however, as Sasuke comes to the conclusion that Orochimaru only wants him as a container and attempts to kill him. During his attack, he emphasized to Orochimaru the superiority of the Uchiha clan, demonstrating that he still holds his clan in the highest regard, and that Orochimaru taking his body would be an insult to the clan's reputation. Unlike Kabuto or any of Orochimaru's subordinates, who address Orochimaru as "Orochimaru-sama" (which shows that they highly respect him), Sasuke simply refers to him as Orochimaru. Sasuke also never called Kakashi "Kakashi-sensei" (teacher) like the others did, something the Japanese would consider as very insulting or rude. Despite his association with the Sound Village, Sasuke does not wear a Sound headband, unlike most other subordinates of Orochimaru. He still wears the fan symbol of the Uchiha clan on his back, albeit much smaller and higher up by his shirt collar. Despite this lack of allegiances to those close to him, Sasuke seems to be unable to bring himself to needlessly harm those that have nothing to do with his quest for vengeance against Itachi, and makes it a point to prevent their deaths when possible.However, this attitude appears to have changed after he learns the truth about Itachi's death and swears revenge against Konoha. Not only does he resolve to destroy all of Konoha(despite the majority of its villagers having no involvement in the Uchiha massacre), but he also seems to be willing to take the lives of anyone who stands in the way of his revenge. Ironically despite his hatred towards Itachi, Sasuke's demeanor has become much like his older brother's. Becoming so single-minded and relentless on whatever goal he sets, Sasuke seems to have developed tremendous self-control, rarely showing much emotion, even in the heat of battle. Only when the situation involves Itachi would Sasuke show visible irritation. Upon learning the truth about Itachi, Sasuke is filled with sorrow and, for the first time since the night of the Uchiha massacre, weeps for his brother's sufferings. After he has mourned Itachi's death, he resolves to avenge Itachi and tells Team Hawk that they would 'crush Konoha'. He later states that he only intends to kill the three elders of Konoha who were responsible for it. However, it is eventually revealed that Sasuke's true intention, which he hid from his team, is to kill everyone in the village, not just the three elders, thus going against Itachi's wishes. Sasuke holds all of Konoha guilty for the death of the Uchiha clan, taking for granted the peace they live in and their wrongful worship of the Senju clan, because of this he believes that the entire village must pay for it with death. Clan History: The Uchiha clan used to war against the Senju in ancient times. Until the Senju and the Uchiha formed together to create Konohagakure. The Senju leader Hashirama was chosen to lead,the Uchiha leader Madara was not happy with that. He argued with that choice,and his clan exiled him for it. Konohagakure's elders,and Sandaime Hokage, Sarutobi Hiruzen ordered Uchiha Itachi to kill the clan. Madara,hoping for vengeance against his clan,aided Itachi in this. Itachi and Madara killed everyone except Sasuke. Amaterasu is an Eye Technique of the Mangekyo Sharingan. It is one of the most powerful ninjutsu in existence, opposite of Tsukuyomi, a genjutsu of similar power. Itachi Uchiha was the first person shown in Naruto that could use Amaterasu. He later gave the power to Sasuke Uchiha. The jet-black flames are said to be as hot as the sun. The flames are extremely powerful, capable of burning through Jiraiya's Summoning: Toad Mouth Bind, which Jiraiya states to be fire resistant. Not surprisingly, it appears to use a large amount of chakra. Chidori is Kakashi's first original technique, though he now uses an S-ranked version known as the Lightning Blade. He created it around the time he was promoted to Jonin, and later taught it to Sasuke. A variation on a regular Chidori developed by Sasuke Uchiha during his two-and-a-half year training with Orochimaru, this jutsu allows the user to generate non-focused electrically charged chakra from his body, instead of concentrating it in his hand. Because the electricity isn't focused, it doesn't kill on contact, instead only paralyzing its victims. By sending the current into the ground Sasuke can stun opponents from a distance. Sasuke can also channel the electricity through metallic weapons like his Kusanagi sword, increasing their cutting power, as well as making body parts cut by them numb. Sasuke reshapes the Chidori in his hand into the form of countless senbon. It is specialized in more speed than the normal Chidori and can cause damage throughout multiple places on the body. Chidori Senbon can become even more effective by using it together with the Sharingan, allowing one to precisely shoot for the enemy's vital points. Using the Sharingan's jutsu-copying abilities, the user can turn any genjutsu back onto its original user. The jutsu prevents the Sharingan user's mind from being taken over by an opponent. The opponent is pierced and immobilized by illusionary yokes, making it an effective means for torture and interrogation. It has only been seen used in response to Orochimaru's Living Corpse Reincarnation. The user breathes fire along a cord or any other type of long object. While the technique is shown in the anime to be even larger and more devastating than Fire Release: Great Fireball Technique (and being able to melt rock), in the manga it is shown to be nothing more than a small burst of flame running along a line of wire. The user to fires several large dragon-shaped fireballs at their opponent. The technique appears to require a lot of chakra to use, as Sasuke had to activate level two of his cursed seal to use the technique. It is able to alter localized weather conditions to the point of making thunder clouds when shot into the air, which Sasuke does to perform Kirin. After performing the necessary hand seals, a ninja inhales air via their mouth and, utilizing a large amount of fire chakra, spews a large fireball from their mouth, incinerating everything in range. The fireball ignites externally (as evidenced by Kakashi Hatake's ability to use the jutsu without burning his mask). The Uchiha clan uses the technique as a "coming of age" technique. This technique apparently requires more than average chakra reserves and most Genin should not be able to do this technique. This jutsu sends multiple balls of fire at a target. It is also possible to hide shuriken within the fireballs, creating an unexpected secondary surprise attack. For the most part, however, this jutsu is used as a distraction. Kirin is an extremely powerful, one-shot lightning technique that strikes in the blink of an eye. The user draws lightning directly from thunder clouds to supplement the power of his or her strike, and controls it with chakra. Because the technique uses natural lightning as opposed to elemental chakra, its power easily outmatches all other Lightning Releases. However, the extreme preparation time required also decreases the technique's efficiency. This technique in the absence of active thunder clouds requires Fire Release: Great Dragon Fire Technique or other such techniques to produce the necessary storm conditions to initiate it. Sasuke flows his Chidori Current through a katana in a manner similar to the Flying Swallow technique. The radiating and chirping blade can easily cut through steel. Furthermore, the body of the person cut by the sword goes numb, taking away their freedom of movement. This jutsu is a variant of Rock Lee's Front Lotus, which Sasuke develops after using his Sharingan to copy the first part of the move. Because Lee wasn't given the chance to finish the attack, Sasuke makes his own ending to it. Like Lee, Sasuke gets to the point where he does Shadow of the Dancing Leaf to get behind an airborne opponent. He then delivers a series a of blows that differ between uses. All variations end with the opponent being thrown to the ground and struck in the chest. Utilizing the abilities of the Sharingan, Sasuke is able to control shuriken that have wire cords attached to them (two held with the hands and one with the mouth) and manipulate their paths to tie an opponent to a nearby large object, binding them. If there is no object, the shuriken will impale the opponent. With the opponent caught, Sasuke can also use Fire Release: Dragon Fire Technique to burn the opponent. The Shadow of the Dancing Leaf is a Taijutsu technique that is used to position a ninja's opponent into a vulnerable aerial position. The ninja will first quickly appear below their opponent, then with a switch upper kick they will launch their target into the air. The ninja will then jump into the air to "shadow" the target with the target's back to their chest. Since this is the opponents blind spot, the user can have various ways of executing the dance with a variety of combos in almost any fashion. Rock Lee uses the Shadow of the Dancing Leaf to place his opponent into a position to do his Front Lotus technique. Sasuke would go on to copy this move to set up his opponent for his Lion Combo. Sasuke could however use the Shadow of the Dancing Leaf after he copied it with his Sharingan, but because he hadn't had the same training as Lee, he couldn't avoid the body strain the technique carries. The user of this technique throws multiple large shuriken in such a way that the first shuriken hides the subsequent ones by blocking the line of sight. To the target, it appears as if only one shuriken was thrown. This jutsu can extend large snakes from the user's sleeves, which will coil around the target and bind them. The further addition of the user's murderous intent can weaken their target's resolve. With Orochimaru's unknown status and his removal from Sasuke, this ability may be gone. This is the basic form of all summoning techniques. It is a space/time type ninjutsu. When summoning an animal it requires a contract, hand seals and the user's blood. The blood is used as a signature to make the contract, which can either be written on a scroll or tattoo to validate it. This is a kind of "ninja tool summon" that, by sealing ninja tools like swords or kunai into, for instance, a scroll or one's clothes beforehand, allows them to be called upon when needed. The greatest advantage of this technique is that the time between "taking out" a ninja tool, taking the right "stance" and actually "throwing" it is greatly reduced. The ninja tools are thrown with the actual speed of a "flash of lightning," ruining the opponent's outset of the battle, and snatching away the initiative. Furthermore, because the summonable ninja tools can remain hidden until right before they are used, if this technique is mastered, there are an exceptional number of possible tactics. History: The second son of Konoha Military Police captain and Uchiha clan head, Fugaku, Sasuke grew up in the shadow of his older brother, Itachi. Itachi was an acknowledged prodigy who graduated at the top of his Academy class at age 7, mastered the Sharingan by age 8, became a Chunin at age 10, and an ANBU squad leader at the age of 13. The Uchiha clan took great pride and interest in Itachi and viewed him as a genius whose work would further strengthen the bonds between the village and the clan. In particular, Sasuke's father took an active interest in Itachi. Itachi, on the other hand, was rather ambivalent and full of oddly conflicting undercurrents, acknowledging Sasuke by taking interest in his progress as a ninja when even their father did not, but spending little quality time with Sasuke. Even after Sasuke enrolled in the Ninja Academy, he still was unable to escape Itachi's shadow. Despite consistently scoring at the head of every class, Sasuke failed to receive any recognition from his father, who defined Sasuke's success only in terms of his older brother. Itachi acknowledged the rivalry Sasuke felt, telling him, "We are unique siblings. I am the barrier you must overcome, so you and I will continue to exist together." Itachi's relationship with his father deteriorated further when Itachi was questioned by other members of the Uchiha clan regarding the death and suicide note of his best friend, Shisui. As Itachi's behavior became increasingly bizarre, Sasuke's father, on a whim and partly due to Itachi's growing distance, decided to spend time with Sasuke. He taught him the Great Fireball Technique, a common family jutsu. Sasuke (age 7 at the time) proved himself to be a genius as well in his own right by succeeded in performing the jutsu in front of his father after only one week of training, surprising him. At that moment, Sasuke finally received his father's recognition; the Uchiha clan considered the ability to perform fire jutsu as proof that one had become an adult. Sasuke's father told him that he could now proudly wear the clan's emblem on his back. More forbiddingly, Sasuke also received a stern warning not to follow in Itachi's footsteps. Shortly thereafter, Itachi massacred every member of the Uchiha clan, sparing only Sasuke. Itachi said that Sasuke was not even worth killing. In addition, Itachi told him, "You've always wanted to surpass me. That's why I'm going to let you live." Itachi also revealed to Sasuke where the secret meeting place of the Uchiha was hidden and suggested that Sasuke go there to learn what the true history and purpose of the Sharingan is. Sasuke thought he has fainted after this, but he recently remembered that he managed to stand back up, awaken his Sharingan and chase after Itachi. Sasuke managed to knock off Itachi's headband, and Itachi was seen shedding a tear after picking up the headband and reapplying it to the side of his head and he beat Sasuke who awoke in the hospital not remembering anything but what Itachi showed him. Roleplay Sample: Sasuke awoke that morning,angry. Angry at Konoha for ordering the assassination. He completely ignored Karin's usual flirting. "Alright guys." He said aloud to his squad. Jugo was in the corner looking at the birds,Suigetsu was polishing his sword,Karin was gazing at him. "Today we're going to Konoha,we're going to finish this!" He exclaimed angrily. As he arrived a Konoha chunin stopped him,telling him he couldn't pass. "I'm going through." He drew his blade,and charged the chunin. If he dodges this,he won't live much longer anyway!! Sasuke felt his life ending. He was old now,he was going to die soon. "I guess this is the end." As he sat there he heard something,someone calling to him. He got up and walked towards the voice. He saw a man standing there,with long black hair and an evil aura around him. "Sasuke,take my power. Use it to survive." Sasuke recognized his voice right away. "Why the hell should I listen to you,Orochimaru?" Sasuke put his hand on his sword. "If you survive,Konoha will be crushed one day. That was what I wanted to do. Now seeing someone else do it might not be the same,but it's close enough." Sasuke thought about it. Even if he's lying and has a way to take over my body,I can counter it again. So I have nothing to lose. "Fine give me your power!" Sasuke yelled with excitement. Orochimaru formed the tora hand seal,and chakra flowed out of him. The chakra formed a snake in midair,and flew into Sasuke. Sasuke looked into a mirror and saw his youth was restored. Finally revenge is within my reach! !